Members of the Calgary Women’s Literary Club which 50 years ago sent its members out to petition for a library met for the last time Tuesday in the Lecture Hall of the Memorial Park Library after 46 years of weekly sessions in the Library they founded. Pictured are long time members Mrs. S.N. Carscallen (Honorary Life Member), Mrs. Olmstead (President) and Mrs. Mayhood. 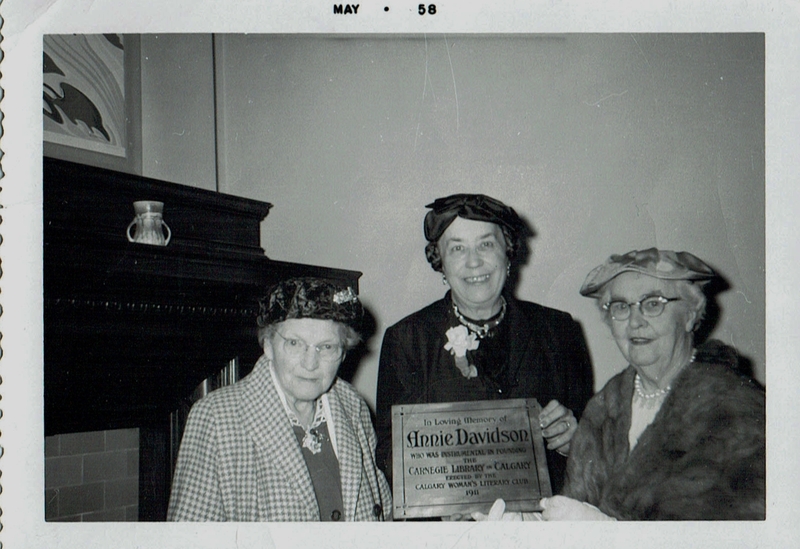 They are holding a plaque which is inscribed in memory of Annie Davidson who was instrumental in founding the Carnegie Library in Calgary. Many thanks to Sue for a wonderful reminder of our heritage. It is unfortunate that the Herald article implies that it was the final meeting of the club. However, we’ve had many opportunities (and many more to come) to share our pride and the pride of former members in ensuring that the CWLC remains as vibrant as it ever was. This is amazing! So wonderful! The Canadian side of the family loved books . Yes, I had trouble with the wording too. I think it means the last meeting of the season. I was curious about the words “last meeting” also. As the one who scanned and posted the photo, I have been true to the exact wording on the back of the photo. Thank you to Sue for providing this wonderful photo. However, since the club is still alive and well, that meeting was clearly not the last to be held. Does anyone know exactly what happened and when it resumed meeting?